Welcome to the world of sound and music. I’d like to show you an alternative to the usual plastic kiddy tooters and shakers that you’ll see at your local toddler group. This Box contains an eclectic variety of diverse hand-made and ethnic instruments sourced from the four corners of the globe. 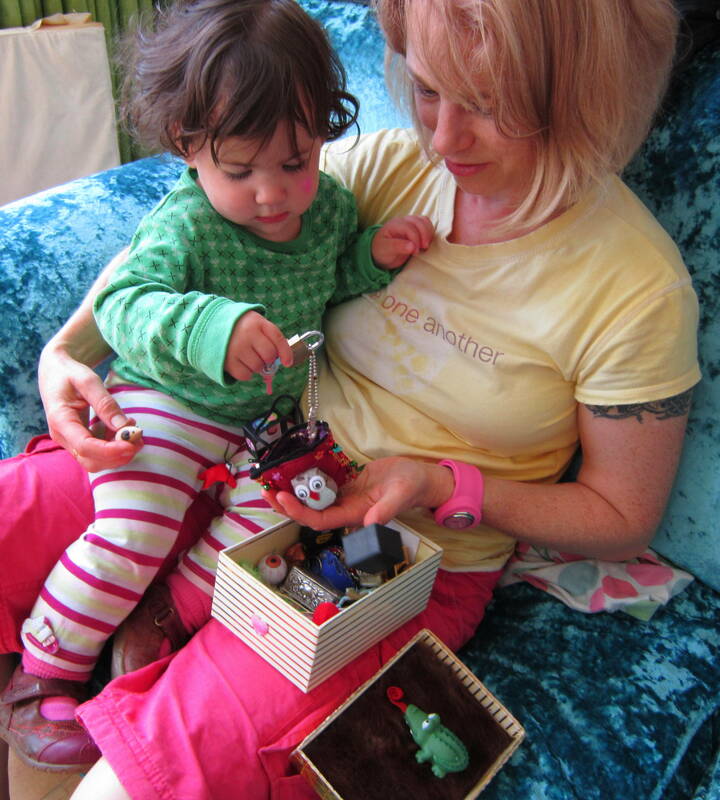 There is not a plastic kiddy-toy-instrument in sight – this box is a passionately REAL collection! 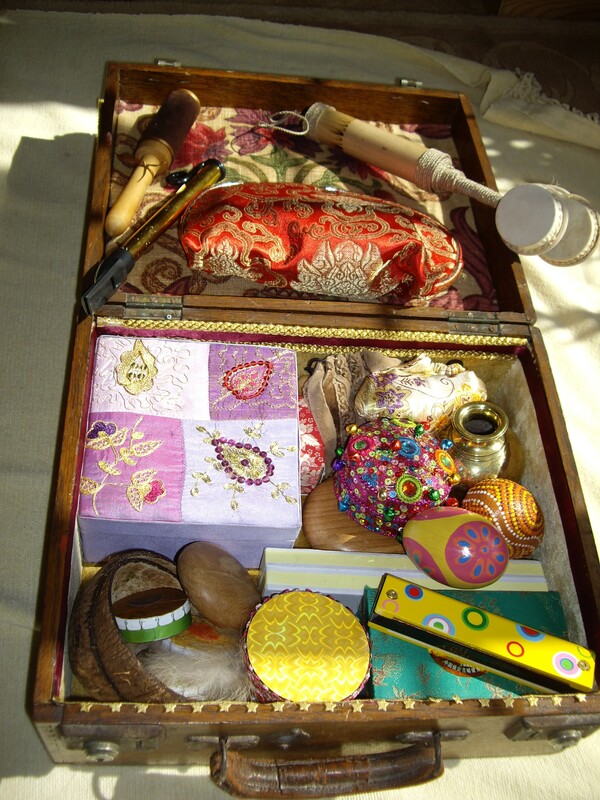 Inside each little bag or box are different instruments and sound-making items unlike any a child will have seen before. There is a Chinese bag full of bells, from goat bells and Indian anklets to Tibetan Tingsha prayer bells and belly dancers’ finger zills. Chinese chime balls enchant babies and toddlers. The star of the show (everybody’s favourite) is a genuine brass Tibetan singing bowl (with its own wood and suede beater) which has a mystically lovely lingering note. There are various different shakers; colourfully painted eggs with seeds inside, and sets of home-made multisensory shakers that reflect the sound they make with their tactile decorations. The sand-filled shaker has yellow felt and soft fluff around it, while the shaker filled with little bells is silver and metallic. The shaker filled with dried beans is covered in leather-look paper with a real leather heart shape on top. 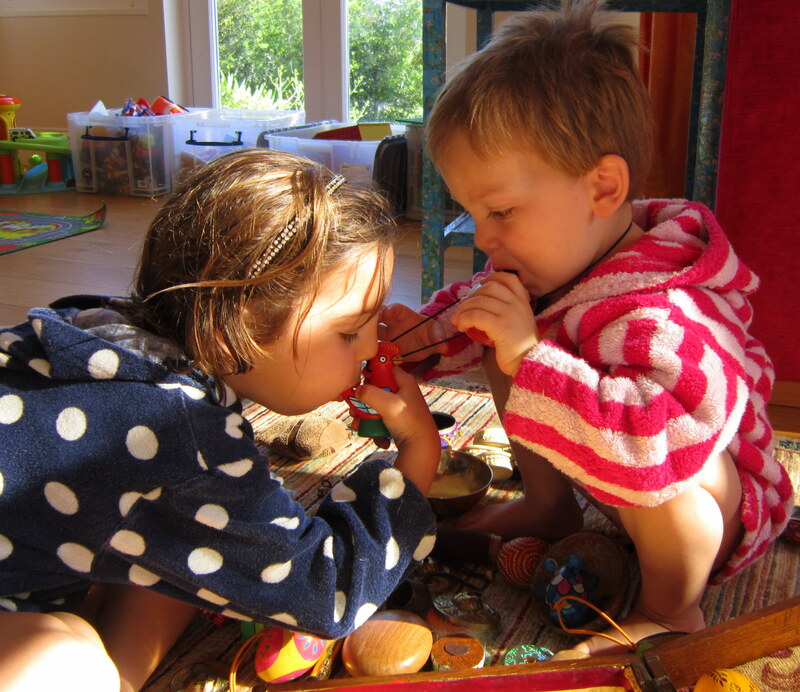 This encourages children to listen and grade the sounds from soft to loud. The percussion section comprises coconut horse cloppers (one side sanded smooth, the other side left rough and hairy for textural conrast), an African pigskin and wood double-headed shaker wrapped with twisted plant twine, cheerful green and blue animal castanets, and large flat wooden pebbles to knock together. The youngest child, although not yet one and a half, knows exactly what he need to learn in this moment. He has turned his back on his plastic collection to post copper pipe end stops into a little brass bottle and then empty them into half a coconut. He does it over and over again. He is doing this to forge new pathways in his brain. He is learning object permanence (where an object disappears but he realises it still exists and can find it again) and refining his hand-eye coordination (controlling where he wants stuff to go) and small motor skills (picking up titchy things). These deceptively simple objects are part of the Sound & Music Box.